Actress Angelina Jolie, actors Will Smith and Tom Cruise, soccer legend David Beckham and Facebook founder Mark Zuckerberg share one thing in common: They love to fence. If you’re looking for something new and exciting, something that gets you moving and engaged, then check out fencing. Many kids get interested in fencing because they are looking for an activity that grabs their imagination, gets them excited, and keeps them motivated. For a lot of kids, traditional sports like football and basketball just aren’t a fit. Many kids want a sport that is intense, more tactical, and more individual. That’s why fencing is one of the hottest, fastest-growing sports in the United States. Fencing is a thrilling, fast-paced, one-on-one sport, that combines quick-thinking skills with physical agility and stamina. Fencing is the modern sport equivalent of sword-fighting (and who doesn’t love a good sword-fight?). 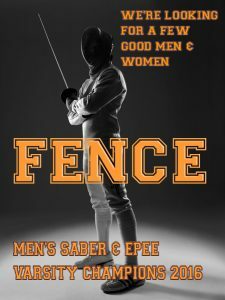 Very different from what you see in movies, real-world fencing is an intense lower-body workout with movements that, at the highest level, can be unthinkably fast. The sport emphasizes dynamic, powerful footwork, fast blade work and strategic thinking. One of the most exciting aspects of high school fencing is the opportunity to compete. 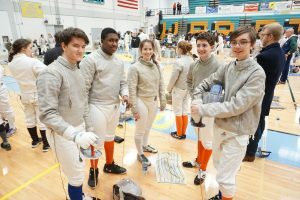 In Illinois high school teams compete in the Great Lakes High School Fencing Conference against schools like Stevenson, New Trier, Deerfield-Highland Park, Evanston and others. Outside of the high school season there are plenty of opportunities to compete in local and regional, and even national and international events. For most kids who play more “traditional” sports, the chance to compete out of state or on a national level is pretty rare. In fencing, not only are those options readily available, but as a niche sport many fencers get regular contact with the top athletes country. It’s not unusual for kids who have only been fencing a few years to meet and even compete against current or future Olympians. That contact with excellence does amazing things for people! Meeting (and fencing) with the top athletes in a sport and getting a chance to meet and compete against kids from all around the country can have a profound effect on a person’s psychology. It changes his or her idea of what’s possible. It inspires them by helping them realize that greatness is achievable. Once a teenager knows that—once he sees that excellence is within his grasp—it can alter the way he approaches everything else in life. Because fencers tend to be among the smartest and most academically gifted athletes in high school, many of the top colleges in the United States including Harvard, Northwestern, Princeton, Notre Dame, Duke, and Columbia actively recruit fencers. And, unlike football, soccer or basketball, the competition for these slots is much less. We hope you’ll consider joining the team!